Quite often when new member joins development team there is a period of adjustment. Libraries, tools, SDKs installations take place chasing not so easy to find common ground for development environment between developers. It can take several weeks until all parts of development environment click together just right on newcomer’s laptop or desktop. For ongoing project this means reduced development time, increased costs, lower quality. After a while all is good and newcomer is on the track. But pretty soon some parts of development environment change, new library or tool has come out and again starts tweaking of development environment, only now for all members of development team and in the end question is “Will all team members have development environment in sync?”. SAP Tools (SAP JVM, SAP CC, SAP NEO, SAP HDBC). Jenkins configured to run developer tasks (package, build, test, deploy, …). helper scripts for Jenkins and running CDE tasks like local/remote HCP deployment, etc. 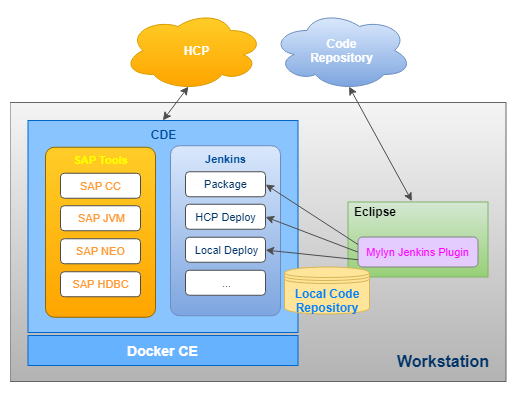 This enables all developers to share same CDE quick and easy and to be able to independently develop and test new features, deploy and test locally (in CDE) or deploy and test on HCP within their own instance of application and database. There is no risk of changing CDE by developers since resulting CDE image is (almost) read only. CDE can be changed when its needed (e.g. library version change) or as planned and distributed to all developers from single source and all developers will share new CDE in a matter of minutes. 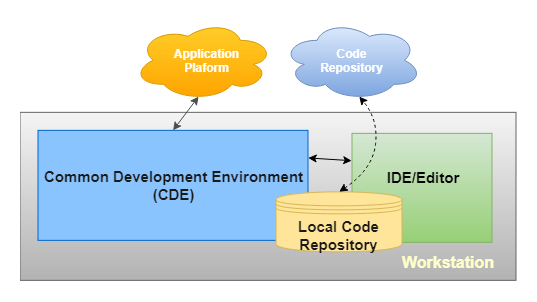 Although CDE solution can be used independently, it can also be part of Continuous Integration, Continuous Delivery or Continuous Deployment practices.